It is great to see these live recordings from the bands only tour in 2004 of the Southwest USA (El Paso, Phoenix, and Albuquerque) finally out. IT was 1½ years ago when I was visiting Charles that I first got to hear a lot of this amazing space rock CD or double vinyl LP set. Besides the best of the tour live material there are also some bonus unreleased studio tracks on the vinyl version and a few on the CD as well. The CD features tracks from all three studio CDs but most of the tracks, including the opening Autopilot are from the debut. If you have not heard this band before, think Hawkwind, Chrome, Helios Creed, Robert Calvert solo stuff… High energy space rock with a real electronic feel and spaced out vocals (inspired by Bob Calvert), flanged and phased out guitars and you have Jet Jaguar…. The version of Set the Controls for the Heart of the Sun is truly excellent. In addition you get a studio version of the Amon Duul II track Archangel’s Thunderbird. Very well recorded and very psychedelic and I think the bands best release as you get a great selection of the bands tracks in really cool spaced versions. I should also mention the really cool artwork by Stefano! The latest from Jet Jaguar features live tracks from their 2004 tour, previously unreleased tracks and some cosmically cool cover songs. "Autopilot" is a great opening track, starting with a mellow spacey intro that lasts about three minutes before launching into the main rocking portion of the song. And it's classic Jet Jaguar, with their punky robotic brand of space rock. Searing guitars, heavy driving rhythms and cosmic proggy keyboards. Other highlights include the blazing yet bouncy "Future Martyr on Supersonic Waves". Songs like "Deathlock", "The Last Kings of Space", "Free Base", "Beam Me To Mars", "Stingray Eyes" and "Dogfight" are pure sci fi space rock 'n roll. The ultimate alien dance party in space. "Turbulent Mirrors" and "Coded Zones" get more into Hawkwind territory than most of the other songs, though they've still got the trademark Jet Jaguar sound. And at nearly 9 minutes "Turbulent Mirrors" really stretches out and explores. Add to all this a killer 14 minute cover of Pink Floyd's "Set the Controls for the Heart of the Sun" and a raw rockin' cover of Amon Düül II's "Archangel's Thunderbird" and you've got a monstrous 76 minute set. And that's just the CD! Vinyl lovers who take the plunge on the 2-LP set (Beeeyoooteeful triple gatefold jacket!!) get all this plus 7 additional tracks, including covers of Can's "Moonshake" and Hawkwind's "Orgone Accumulator". 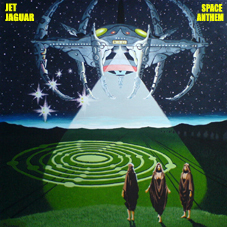 I've described Jet Jaguar in past reviews as a cross between Chrome and Hawkwind, but after listening to much of the band's music over the years I'd say the Chrome influences are stronger, though Jet Jaguar are FIRMLY in the space rock realm, and have a considerably more rollicking good time rock 'n roll edge than the intensity of Chrome. RECOMMENDED!